Anyone with sewing experience knows the beauty and potential that lies in even a single yard of fabric. Before we’ve even made the first cut, we always feel like we can envision all the gorgeous things that piece of fabric might be transformed into. If you don’t know how to sew, however, looking at a piece of fabric might feel a little bit daunting. Don’t fret, though! 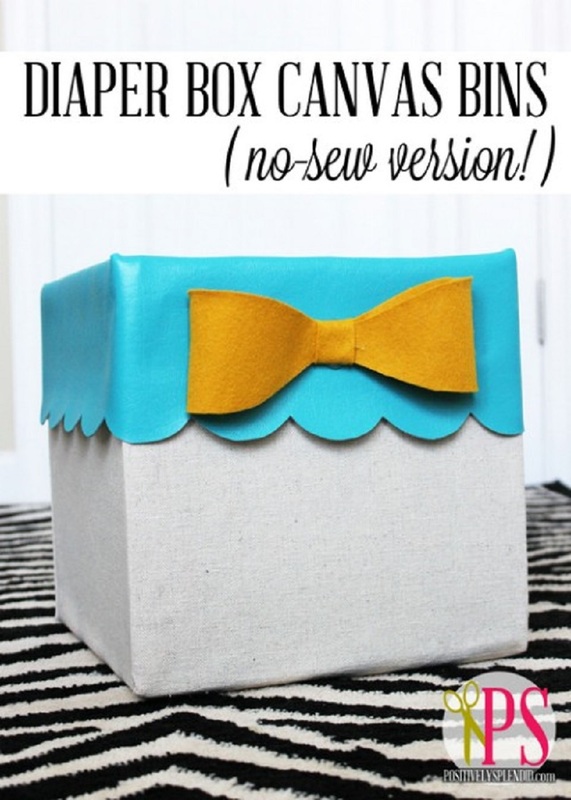 There are actually countless awesome DIY projects that you can make with fabric without even digging out a sewing needle or thread. Check out these 15 super fun no-sew fabric projects that are made using all kinds of other crafting and DIY skills! Sometimes working with fabric to create something lovely is really just as simple as cutting it into the proper size and shape. Even if you don’t take what you’re making much farther than that, you’ve still just made something lovely out of fabric from scratch! 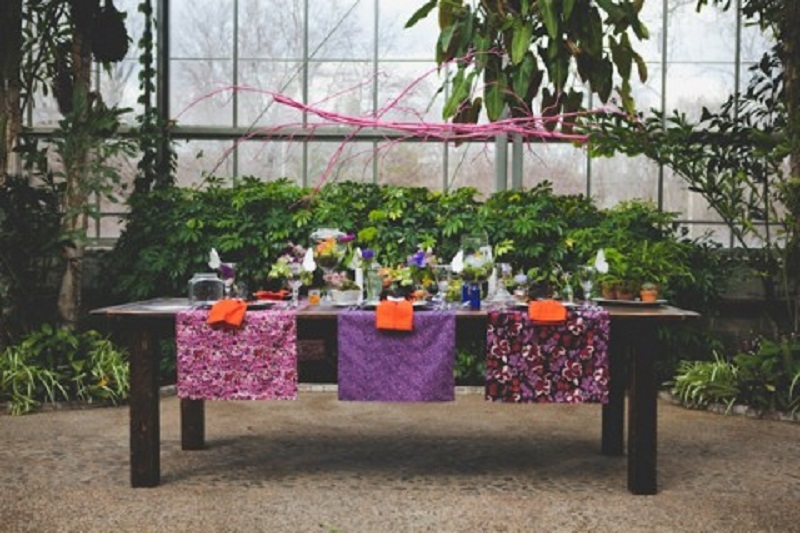 These fun patterned table runners from Ruffled Blog are a great example of what we mean. They’ll even teach you how to keep your edges tidy without any sewing! If you as us, some of the very best no-sew fabric projects around are the ones that are made from old clothing. Besides letting you create something from a material you know you like (because you already owned it), projects made from old clothing let you upcycle a garment to give it a new lease on life rather than getting rid of it. 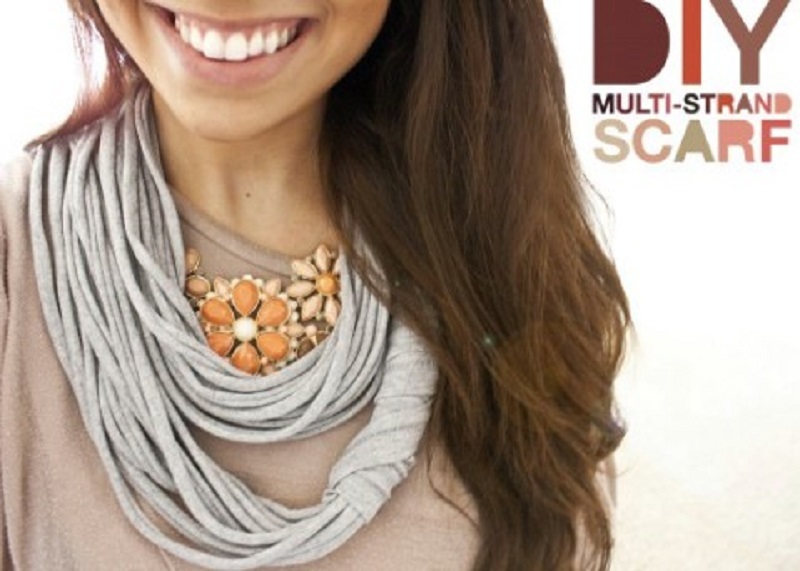 Check out how Rabbit Food for My Bunny Teeth made this adorably stylish multi-strand scarf without even using a needle or thread. We’ve always lived in homes that had classic Roman shades on the windows and doors but we never thought of making our own until recently because the ones we’d had before were always store bought. One day, however, we decided we were bored of having shades that were just plain white, so we started looking into the best ways to make ourselves some shades with a pattern of our choosing. As it turns out, our favourite tutorial was a no-sew pattern that was easy as pie! 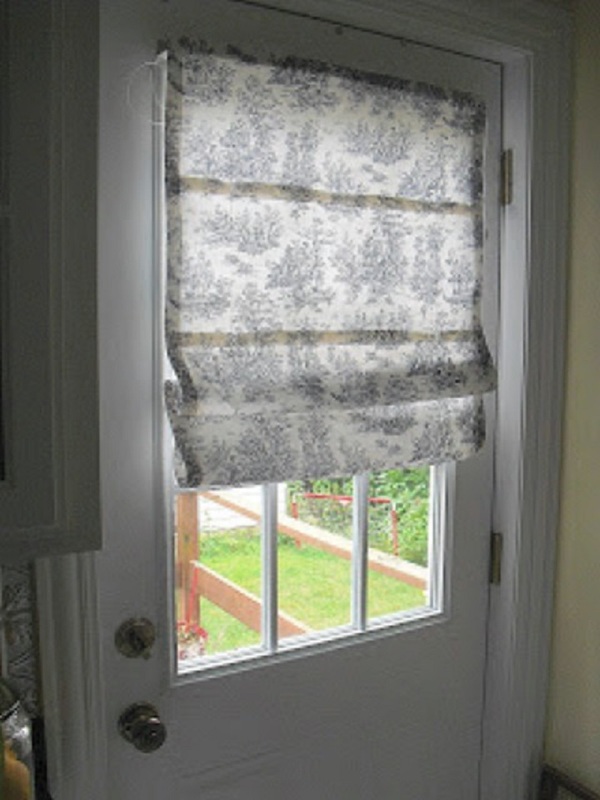 Get the full details for making Roman shades of your very own on A Pretty Cool Life. We’re huge fans of decorative throw pillows. In fact, we’re such big fans of making our own pillows that we have different styles that we roll over seasonally and sometimes our families have to ask us to clear some of the fancy DIY pillows off the couch so they actually have room to sit down and watch TV. We’re always surprised, however, at how many of the coolest textured DIY throw pillows are actually made using techniques that don’t involve any sewing! 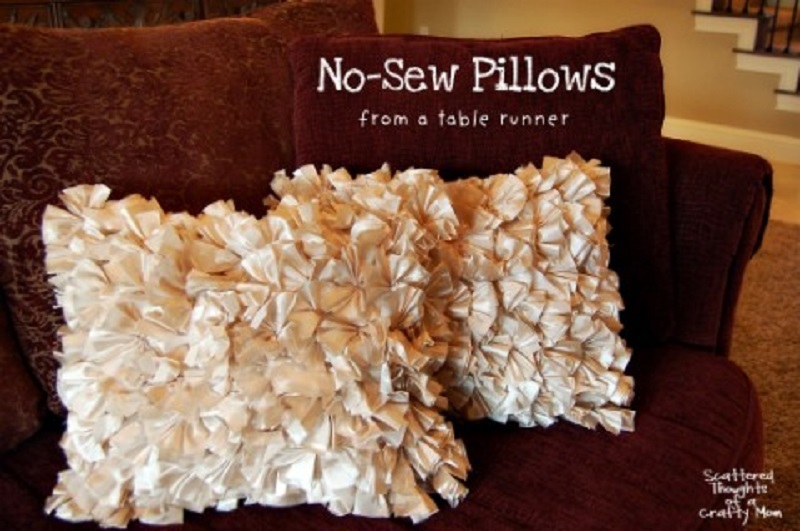 This awesome ruffled pattern from Scattered Thoughts of a Crafty Mom is exactly the kind of pillow we mean. Do you love patterned fabrics but you don’t know how to sew? 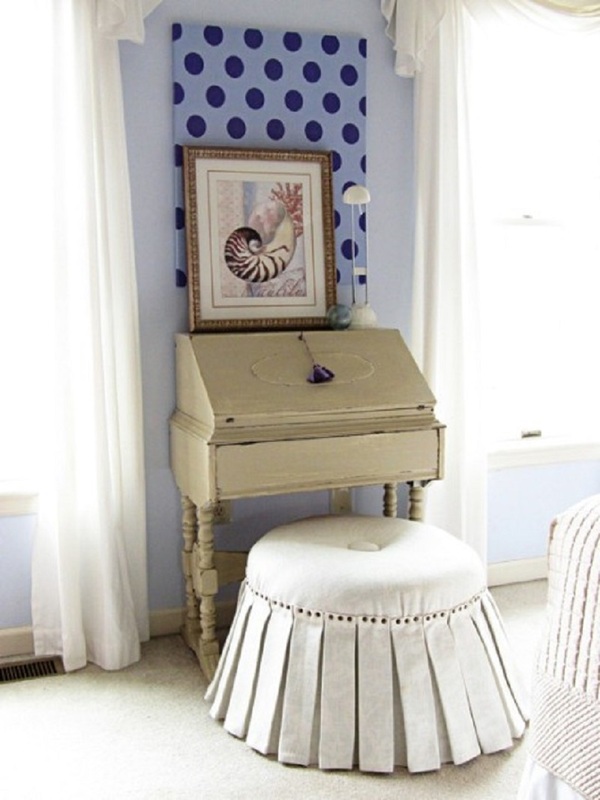 Do you love canvas wall art but you’re not very confident in your painting skills? Well, luckily for all of us, Belladia has found a way to combine fabric and canvas to solve both of those problems and still get you some lovely wall art made with patterned fabric! Their tutorial shows you how to stretch the fabric across the canvas, smooth it out properly, and secure the edges well. Believe it or not, one of the most interesting fabric projects that you can do to really make a statement piece for your home actually doesn’t even involve sewing in the first place! Upholstering simple furniture pieces is usually done with staples, bolts, or brads of some kind. Check out how In My Own Style made this wonderful cushioned ottoman complete with a glamorous pleated skirt! Are you actually quite familiar with no-sew fabric projects and you have experience doing them but you’ve been scrolling this list hoping to find little projects that you’ve never tried before that might be small enough to use up some of your ends and scraps? Then we think we might have found the pattern for you! 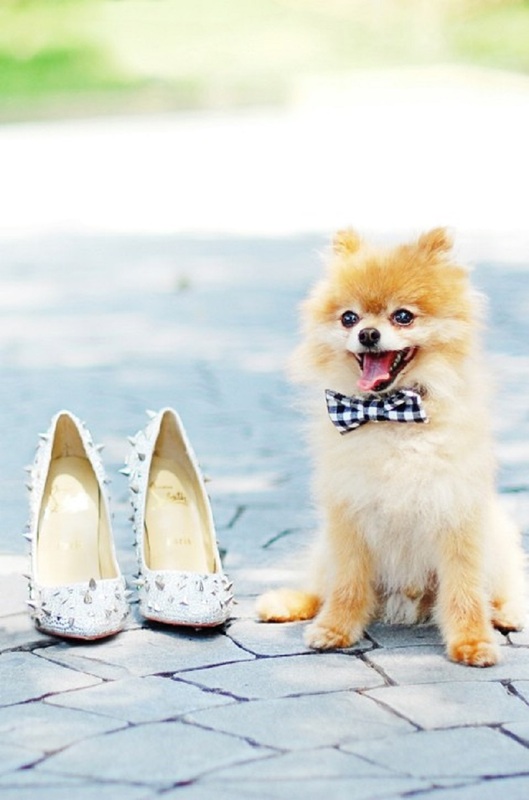 These adorable little puppy bow ties from Chic Sprinkles are so cute that we’re tempted to make them even though we don’t even have a dog right now. We’ll make our cats wear them instead! When it comes to fabric crafts that don’t involve sewing, there are plenty of techniques to try and we certainly recommend giving them all a shot. Few, however, are quite as much fun to do as making cute little spiralling rosettes from simple scrap material. 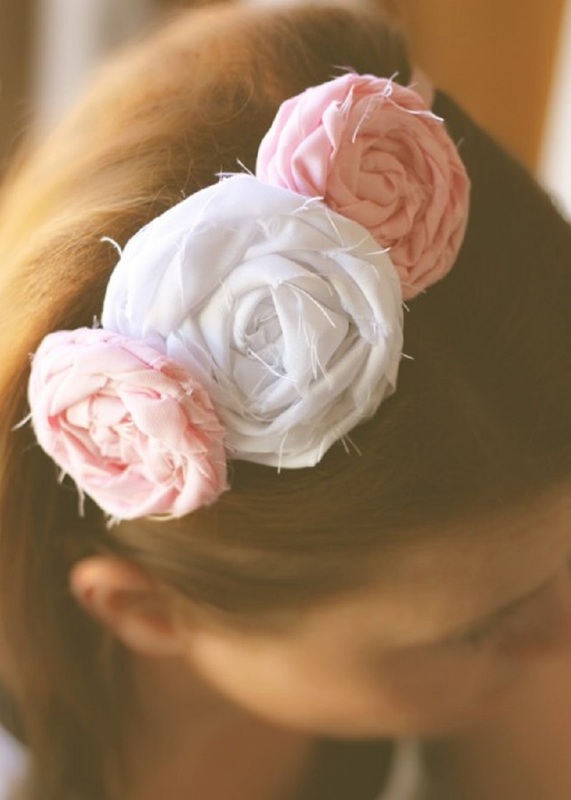 This awesome tutorial from Handmade By Jill shows you not only how to make the rosettes themselves, but also how to turn them into an adorable hairband! Remember when we said that we loved making fabric crafts from old clothing because it let us upcycle garments we weren’t using into something new? Well, clothing isn’t the only thing you can do that with! Just in case you don’t have any old t-shirts lying around, Crème de la Craft shows you how to make a cute (and totally useful) tote bag out of an old pillow case instead! If you’ve never made fringe tied blankets from big, brightly coloured pieces of warm fleece before, you’re missing out! 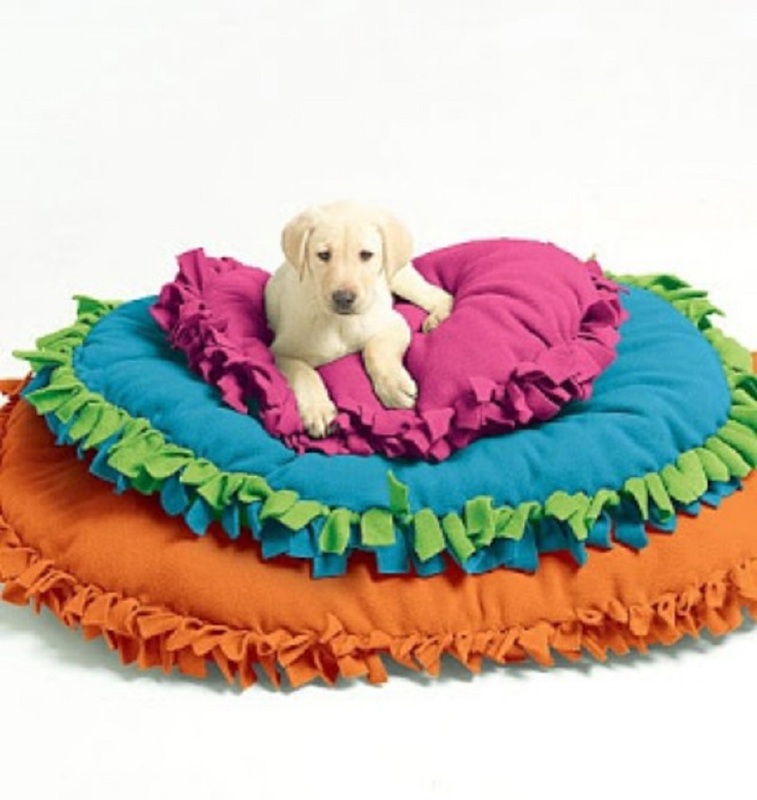 If you have, however, and you enjoyed them technique but now you have enough blankets, then check out how Frugal Freebies took the idea a little further and made pet beds using the same tying technique, just with some stuffing involved! If we’re being honest, these cute little cushions are actually so simple that you could jump straight to making these without even practicing on a blanket first. Do you have a pair of heels that you’ve hardly worn because, even though they fit well and you like their visual style, they’re a colour or pattern that you’re just not into any more? Maybe you loved them once upon a time but the outsides have become very scuffed even though they’re still in great shape otherwise? 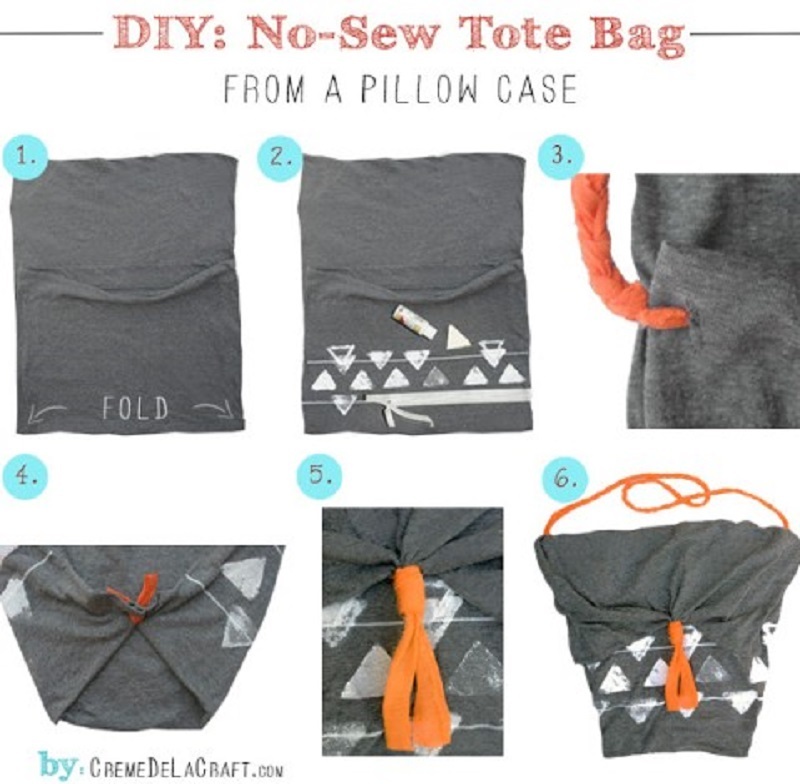 Then spruce them up and make them into a whole new pair by covering them in fabric! See how it’s done in more detail on Love Maegan. We’re sure it comes as no surprise to you that many of the no-sew fabric crafts that will come up when you start searching for them are minor clothing alterations, but we sure don’t see that as a bad thing! Nothing makes us want to wear a piece of clothing more than having updated it into something even more stylish than it already was all by ourselves. We love the way Pop Champagne used knots here to create a netted pattern in the bottom of a tank top rather than doing any sewing. Have you been looking for a way to increase the amount of storage space in your bedroom, crafting room, or the toy room without cramping the current décor scheme and aesthetic you’ve already built there? 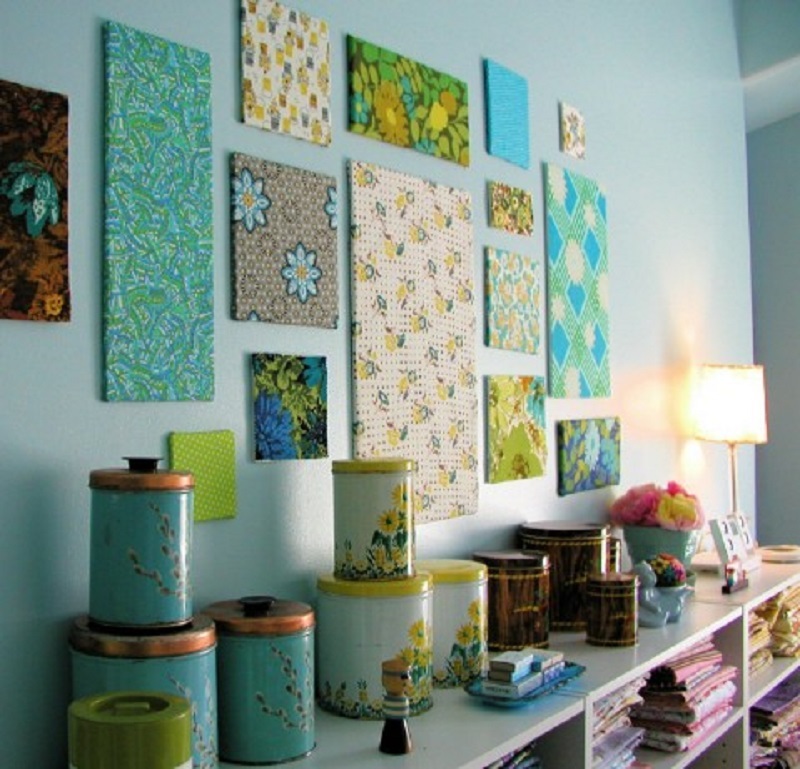 Then choose some fabric that complements the space and cover your storage boxes in it! Positively Splendid shows you a great way to do it without having to sew, but also without have your edges peel up when you put the boxes to use. If you’ve never worked with heat fusing fabric bond sheets designed to stiffen fabric so it keeps its shape, then we are about to open your DIY world up in a big way when it comes to fabric crafts! 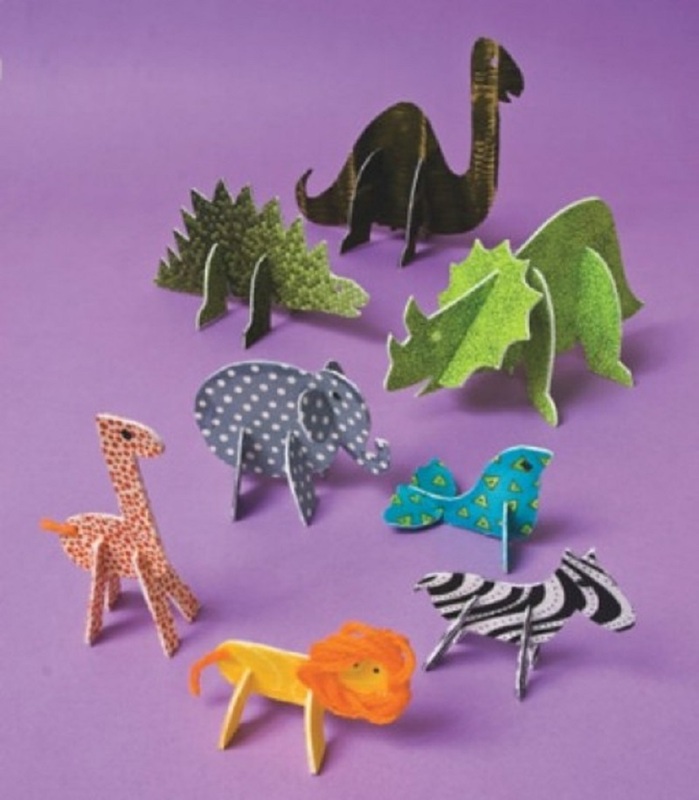 As a starter project, check out these adorable little standing zoo animals from CTPub Blog. They’re a great way to use up fun patterned fabric ends and they’re also a great way to learn about bonding fabric, which gives you just another fabric skill to work with until you have time to learn more about sewing! Hair bows in all sizes are all the rage right now, but we know a lot of people who hesitate to make their own because they’re convinced that all the cute designs involve sewing the bow’s fabric in some way. Luckily for all of us, The Alison Show is here to show you why that’s not entirely true! 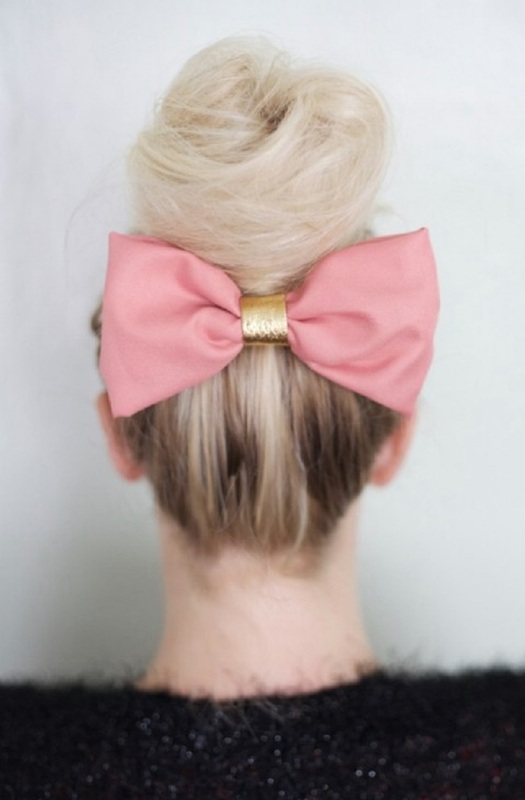 Their tutorial guides you through the process of making a cute hair bow in whatever colour or pattern you like most without even touching a sewing needle or setting eyes on a sewing machine. Do you know someone who loves colourful, patterned fabric and always wants to make things from it but doesn’t know how to sew? Share this post with them for a little bit of inspiration!